A FOSSIL IS ANY EVIDENCE OF PAST LIFE PRESERVED IN ROCK. 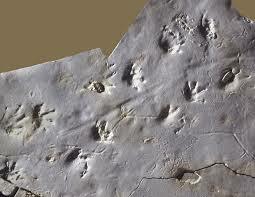 They can be shells, bones, petrified trees, impressions made by leaves, footprints, oreven worm burrows. FOSSILS CAN ONLY FORM IN SEDIMENTARY ROCKS. This is because the remains of the earlier life would be quickly destroyed by magma, heat and pressure, involved in forming other igneous or metamorphic rocks. FOSSILS ARE IMPORTANT FOR US FOR SEVERAL REASONS. THEY ARE THE BASIS FOR THE ORGANIZATION OF THE GEOLOGIC TIME TABLE. The appearance and disappearance of organisms throughout time is how we divide up the earths history into different periods. THEY PROVIDE EVIDENCE THAT EVOLUTION IS TAKING PLACE. THEY CAN INFORM US ABOUT WHAT THE ENVIRONMENT WAS LIKE IN THE PAST. THEY HELP US CORRELATE ROCKS.Finally, as we will learn in the next few lessons they help us correlate rock layers. Fossils can become preserved in sedimentary rock layers in several ways. In very very rare cases, the fossil might be the actual remains of the organism. In these cases the whole organism has been preserved including the soft tissures like skin, hair, organs, etc. The remains are intact undecayed and unchanged. More often, fossils do not contain the soft tissues of organisms. In replaced remains fossils, the hard parts of the organism like the bones and teeth are replaced by minerals. The replacement happens as groundwater comes into contact with the remains and slowly erodes the hard material away and leaves mineral in its place. This results in a good copy of the original remains made of minerals. Sometimes, the original remains are eroded away and not replaced by minerals. The result is a hollow depression in the rock called a mold. If the mold is then filled later with minerals the fossil is called a cast. Trace fossils are not the preserved remains of an organism at all, but rather evidence of life such as worm holes, footprints or tracks made in mud that eventually formed into a rock preserving them for thousands of years. ACROSS THE BOTTOM OF THE GEOLOGIC TIME TABLE YOU WILL SEE PICTURES LETTERED A - Z. THESE ARE THE IMPORTANT INDEX FOSSILS IN NYS. YOU WILL ALSO NOTICE THAT ABOVE THEM IN THE TIME DISTRIBUTION OF FOSSILS THE SAME LETTERS APPEAR. THESE ARE HERE TO SHOW YOU WHEN EACH IMPORTANT NYS FOSSIL LIVED. For example: When did the organism Phacops live? Follow the row C is in back to the left to see which period Phacops lived. Phacops lived during the Devonian Period. For example: In which NYS Landscape Region could we find fossils of Eurypterus? First we need to use the Geologic Time Table to determine when Eurypterus lived. If we turn to pages 8-9 we can find that Eurypterus lived during the Silurian Period. Second, we need to turn to the Bedrock Geology Map on page 3 of the ESRT. Here, if we need to look at the Legend to find the pattern on the map that represents rock formed during the Silurian Period. Now we turn to page 2 and find the same area on the Landscape Region Map. We can see that Eurypterus can be found throughout the Erie Ontario Lowlands!